China's economic slowdown has not impacted the consumers' purchasing power, at least not when it comes to high-end beauty products. Last year, thriving demand from the Chinese market for luxury skincare products bolstered the revenues of major cosmetics makers - including L'Oreal, Estee Lauder and Shiseido - that were facing tougher times in Europe and the US. Driven by rising Chinese demand, French beauty group L'Oreal's revenue from the Asia-pacific region, with sales of more than 7 billion euros ($7.89 billion) last year, overtook North America to become its second-largest market. As a result, L'Oreal reported 7.1 percent year-on-year growth in sales to 26.9 billion euros in 2018. That was its best year of growth since 2007 even though it was "held back by some markets difficulties" in Western Europe, according to the company's financial statement released last week. L'Oreal has a number of luxury cosmetics brands including Lanc?me, Yves Saint Laurent, Giorgio Armani and Kiehl's. Similarly, New York-based Estee Lauder - owner of brands such as La Mer and Tom Ford - said sales increased 7 percent to $4.01 billion in the fourth quarter in 2018. The figures were contained in the financial statement released last week. Specifically, sales in the Asia-Pacific market, led by the Chinese mainland and Hong Kong, jumped 20 percent year-on-year to about $1 billion, which helped "offset weaker demand in North America." In a conference call with analysts, Estee Lauder Chief Executive Fabrizio Freda said that "demand for prestige beauty from Chinese consumers has remained strong in spite of macro issues and potential risks to the economy," morningstar.com reported. As foreign cosmetics makers profit from strong Chinese demand, their robust sales growth has quashed worries that the country's economic downturn could dent consumer demand for luxury goods. Industry observers said that the burgeoning demand shows the rise of China's "new wealthy middle class," especially the young born in the 1980s and 1990s, who command decent incomes. "Unlike their parents, China's new middle-class consumers no longer regard premium skincare and cosmetic products as luxury consumption. They care about looking good. They are willing to spend more and thus take those luxury products as basic necessities," Chen Min, CEO of cosmetics industry group Donger Media, told the Global Times on Tuesday. The post-90s generation buys about half of the high-end cosmetic make-ups in China, according to Kantar Worldpanel. 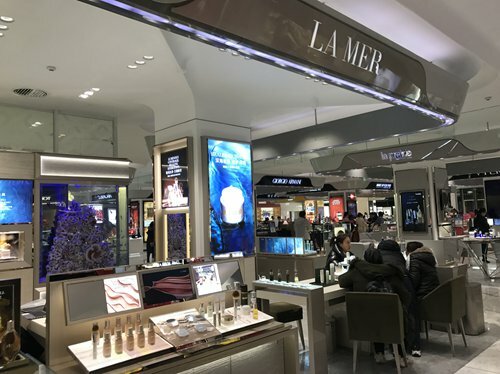 A 20-something Beijing-based white collar worker surnamed Zhang, who now spends about 20,000 yuan ($2,951) a year on buying skincare products from La Mer, Shiseido, and Clé de Peau Beauté, told the Global Times that she is unlikely to cut her budget on such items even if her income falls. Another reason for the rising sales is the upgrade in Chinese consumption, which pivots toward valuing quality and brands, Chen said. Analysts have forecast that Chinese demand for luxury beauty goods will continue to climb in the coming years. "Skincare products are a more affordable spending compared with luxury fashion items such as fur coats and bags, so they have more resilience even if China's economy cools down," Chen said, summarizing the phenomenon as lipstick effect.